The British Legion breaks with a brand new poster campaign produced by Toast's digital arm - Toastdigital for this year's Poppy Appeal. 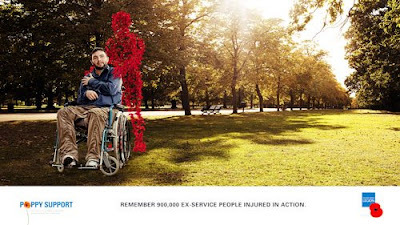 The Poppy Man has been a feature of previous press and poster campaigns for the Royal British Legion. This year, Toastdigital brought him to life. This 3D figure appears out of falling poppies and extends a comforting, helping hand to an ex-serviceman. He features in cross-track poster sites throughout Central London Underground helping to highlight Poppy Week and the plight of those who have served and are currently serving in the Armed Forces and their dependants.